It's been forty years since the Class of 1982 arrived on the campus of NC Wesleyan College as freshmen in 1978. Dr. Dewey Clark, Wesleyan President, was part of that freshman class. NC Wesleyan will honor the Class of 1982 and this forty year milestone at the opening convocation to kick off the new school year on Tuesday, August 21 at 10 AM in Minges Auditorium of The Dunn Center for the Performing Arts. Tom Madjar, a member of the Class of 1982, will be guest speaker. Keynote speaker for the Class of 2022 convocation is Allen West, retired U.S. Army Lt. Colonel and former member of the U.S. House of Representatives. The seventh annual "Rock the Mount" kicks off the new school year on Tuesday, August 21 beginning at 11:00 am on the Southern Bank Green at NC Wesleyan College. Sponsored by NC Wesleyan and the City of Rocky Mount, Rock the Mount is a free event aimed at introducing our students, staff, and faculty to area businesses, churches and non-profit organizations. Scheduled from 11:00 am to 2:00 pm, this year's event includes 70 vendors, music, food, a scavenger hunt and giveaways. Afternoon and evening activities have been added this year to continue the celebration. Rock the Mount "Showcase", scheduled from 2:00 pm to 3:30 pm, will feature blue and white scrimmages between the men's and women's soccer teams and the volleyball team. To end the day's activities, Rock the Mount "After Party" (7:00 pm to 10:00 pm) will include food, a mechanical bull, a ferris wheel, live music, a dunking booth and other carnival type games and rides. Rock the Mount promises to be a day of food, fun and new friendships as NC Wesleyan and the City of Rocky Mount welcomes the Class of 2022 and returning students to our GREAT CITY! North Carolina Wesleyan College will host a Student Employment Fair on August 28, 2018 from 1:00 to 3:30 pm in the Garner Lobby of The Dunn Center for the Performing Arts. The college seeks to assist students in easing the financial challenges of being a full-time college student. We are inviting local employers to meet our part-time job seeking students and discuss potential opportunities with them. The college welcomes employers to register for this event free of charge no later than August 17. Click here for registration form. Questions may be directed to Kenny Dickerson kdickerson@ncwc.edu (252) 955-2998 or fax (252) 985-5580. Planning a trip to the Rocky Mount area? Live in Rocky Mount and need a getaway? 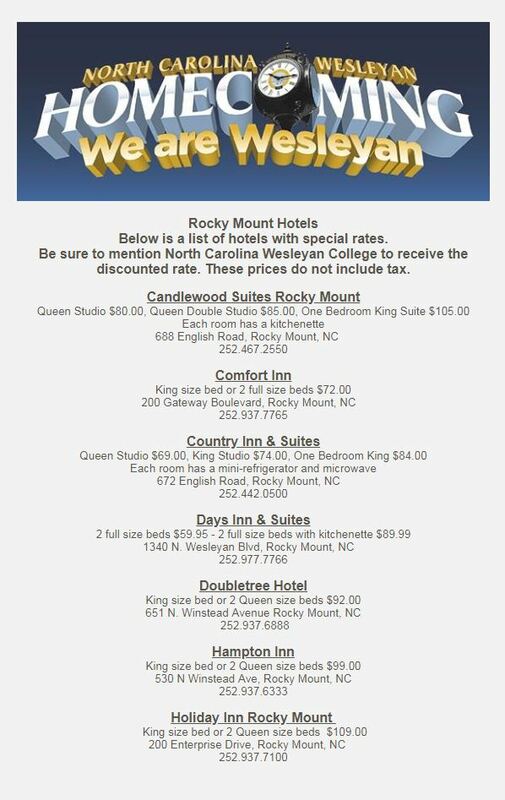 The Bellemonte House Bed & Breakfast, conveniently located on the campus of NC Wesleyan is a great place to stay or to plan your next event. Watch below as Denise and Rick Wilkie, managers of The Bellemonte House Bed & Breakfast, give you a tour to show off some of its great features. For more information visit the website or call Denise Wilkie (252) 955-2054. The Dunn Center for the Performing Arts kicks off their 2018-2019 Season September 14th at 7:30 pm with the popular band, The Chairmen of the Board. With one of Soul Music's all-time great group names, the Chairmen of the Board has pleased music lovers for over 30 years. Over the years, the Chairmen of the Board were among Soul Music's most consistent hitmakers, scoring big with "Pay to the Piper," "Finders Keepers," "Chairman of the Board," and the blissful "Everything's Tuesday. ".Even though iconic leader General Johnson is gone, forty-year member Ken Knox carries on the tradition of "Give Me Just a Little More Time" and "Carolina Girls." Beach music as bona fide as it gets! For tickets contact the Dunn Center box office at (252) 985-5197 or click here to purchase tickets online. The Young Entrepreneurs Academy is an exciting year long class that transforms middle and high school students into real, confident entrepreneurs. YEA! 's mission is to develop and deliver exciting, experience-based entrepreneurship programs to young people to enable them to transform their ideas into real enterprises that create economic and social value for a better world, develop the character of tomorrow's leaders, and enable educational institutions to provide successful entrepreneurship and social innovation training programs for youth between the ages of 11 and 18 around the country. Students will have the opportunity to learn from real business professional mentors, conduct their own market research, develop their own business plans, participate in fun, business-related field trips, and more! Now recruiting students for the YEA! Class of 2019! Contact local program manager Leah Easterlin at leasterlin@ncwc.edu to nominate your favorite students or visit yeausa.org. Student application deadline September 15. Earn your fully accredited Master of Science in Criminal Justice degree 100% online. Cost of books for the entire program will be less than $200. Finish your degree in 12 months. Email Michael Drew at mdrew@ncwc.edu or call (252) 985-5200 to learn more or visit www.ncwc.edu for curriculum, admission requirements and to apply. Rev, Marvin Alexander '14 is the Executive Director and Founder of the Mephibosheth Project, Inc., (MPI) a non-profit in the Goldsboro, NC area. "MPI was formed in 2007 to help those who have been incarcerated re-enter into the community after they are released. Over the years, the program has helped countless men and women gain a solid footing back into the community, with employment opportunities and housing." The MPI program was officially recognized recently by the NC Department of Public Safety as a re-entry program for ex-offenders. The vision, faith and leadership of Rev. Alexander impacts many lives in the Wayne County area. He is a 2014 graduate of NCWC's Goldsboro campus, where he majored in Religious Studies with a minor in Psychology.